Protective clothing is required to be worn when fencing as it protects you from injury when being hit by a sword. The Mask is worn to protect the head from injury. The Mask withstands 800 - 1600 newtons of force and has a padded bib which protects the neck. 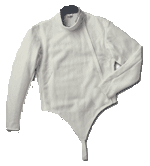 The Fencing Jacket protects your torso and arms, it is close fitting, padded in the chest area with a high collar and closed with a zip on the non sword arm side. Jackets are made of Kevlar. The plastron is a half jacket worn under the main fencing jacket for extra protection on the weapon side of the body. The plastron unlike the jacket has no seam in the armpit. The breeches are designed to protect your upper legs and waist. They are high waisted and the jacket must have a 4 inch overlap with the breeches. Lame jackets are worn over the fencing jacket. The lame is made up of cloth with a metallic thread interwoven. It is required for use with the electric boxes. A fencing glove protects the hand from injuries, while the gauntlet covers the opening of the jacket sleeve, preventing an opponents blade from going up your fencing arm. A temporary and cheap alternative is a gardening glove. 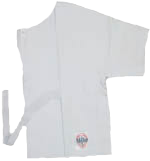 Chest Protector is required by all female fencers for added protection of the chest area. Suitable long Socks and Fencing Shoes are required. Trainers with a low heel profile are also acceptable.